The pursuit of wellness is one of the most important and rewarding endeavors a person can embark upon. Living in a state of wellness can dramatically improve a person’s life, providing them with fulfilling relationships, happiness and a sense of meaning. But what exactly is wellness, and more importantly, how can someone work toward achieving it? We should start by distinguishing between wellness and health, which are related but distinct concepts. “An active process” means wellness is an ongoing effort that a person must invest themselves in, not something that can be granted to them. It also means improvement of a person’s wellness is always possible. “Through which people become aware of” means that wellness is dependent upon a person seeking out and discovering new ways to improve their lives. People don’t always know how they can improve until they learn new information that can help them. “And make choices toward” means that a person can and should consider a variety of options for improving their life and attempt to select the best ones for their circumstances. It also means the person must act on their own behalf to achieve desired outcomes. “A more successful existence” means a life filled with well-being, happiness, accomplishments and purpose. Every person must decide what these things mean for them. In some ways, then, wellness is a method by which we can achieve complete physical, mental and social health. Even though we’ve defined wellness, it may be difficult to know how to start practicing wellness in your life. After all, a wide variety of factors contribute to a person’s happiness and well-being. The Substance Abuse and Mental Health Services Administration (SAMHSA) divides wellness into eight separate dimensions that take all the major aspects of life into consideration. 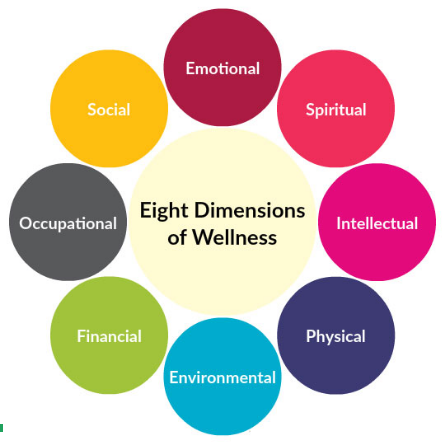 Understanding these dimensions can help a person evaluate their wellness in each category and form plans for improving their life. Physical wellness means recognizing the need for physical activity, diet, sleep and nutrition. To be physically well, you should strive to stay active, even if it’s only through small actions like taking the stairs instead of the elevator. You should also do your best to make healthy choices when eating and get plenty of sleep each night. Emotional wellness means coping effectively with life and creating meaningful relationships. An important part of emotional wellness is being aware of your feelings and sharing them with people you trust. Pay attention to what you’re feeling and why you’re feeling that way, and reach out to people who are close to you when you’re struggling with upsetting emotions. Social wellness means developing a sense of connection, belonging, and a well-developed support system. To develop and maintain your personal relationships, try calling, e-mailing or visiting an acquaintance at least once a day. If you’d like to make new friends and relationships, consider joining a club or volunteer group. Occupational wellness means getting personal satisfaction and enrichment from one’s work and hobbies. In order to find satisfaction in your work, you should try to pursue career or volunteer opportunities that align with your interests and passions. When at work, take breaks to avoid becoming overwhelmed, and try not to set unrealistic performance expectations on yourself. Intellectual wellness means recognizing creative abilities and finding ways to expand knowledge and skills. Reading books, whether they are informational or for entertainment, is a wonderful way to stimulate your mind. You might also consider attending community events that interest you or enrolling in skills training classes at your local library. 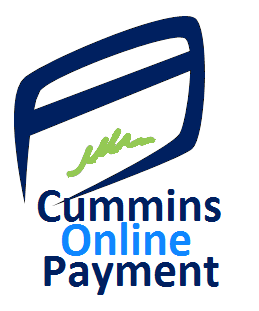 Financial wellness means finding satisfaction with current and future financial situations. Make an effort to learn about finances so you understand which financial behaviors are wise and unwise. Then work toward creating financial stability by following a budget that allows you to save for your future. You can also seek out advice from financial experts if needed. Environmental wellness means achieving good health by occupying pleasant, stimulating environments that support well-being. In general, you should spend as much time as possible in calming or uplifting places. Take the time to go outside and appreciate nature, and donate or recycle things you don’t need to make your home a less stressful environment. Spiritual wellness means expanding your sense of purpose and meaning in life. 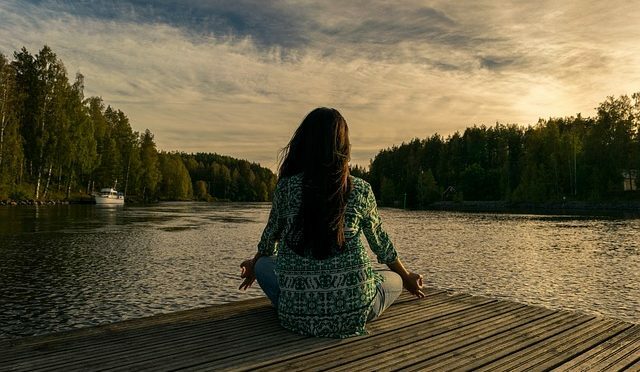 Practicing a religion can improve spiritual wellness for many people, but any activity that enhances your sense of connection to yourself, nature and other people is also good. Discover what values, principles and beliefs are most important to you, and do your best to help others when they’re in need. If you regularly work on maintaining and improving these eight dimensions of wellness, you’ll be better able to create a life full of health, happiness and purpose. Time to talk about the elephant in the room. It’s uncomfortable for most professionals to acknowledge, but everyone working in the field of mental health has a deep personal connection to mental health issues. The few who are brave enough to embrace their personal stories offer special insights, and help others in our community find recovery as well. In “The Power of Vulnerability“, Brené Brown makes a powerful (if paradoxical) point about embracing what we’re most ashamed of, rather than running from it. In Indiana, peer recovery specialists have learned to help others by exposing their own vulnerabilities. 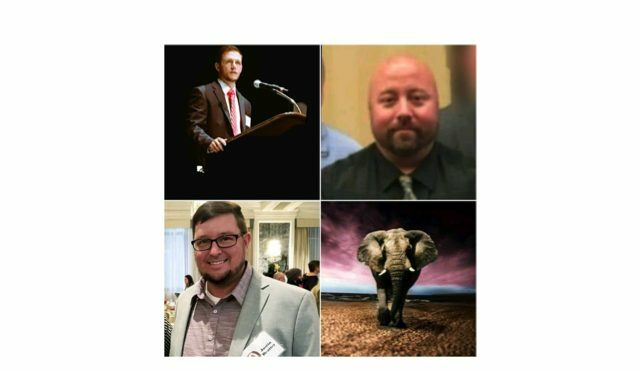 On a crusade against stigma, peer specialists like (Cummins’ own) Debbie Roman, Justin Beattey, Jason Grant Padgett, and Brandon George exemplify the power of humility and servant leadership in our community by sharing their own personal stories of recovery. What exactly makes peers so effective–and why aren’t they used more in Indiana? 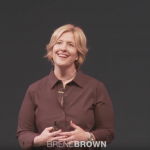 Brené Brown's TED Talk: "The Power of Vulnerability"
A Peer-Based Recovery Support (PBRS) such as a Recovery Coach (CAPRC) or Certified Recovery Specialist (CRS) is an individual who uses lived experience to provide both hope and options for those experiencing severe addiction and/or mental health issues. These individuals exemplify Brené Brown’s now classic TED Talk; by openly discussing their own experiences with mental health, they’ve turned their perceived liability into their greatest strength. 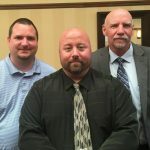 A Peer serves as a companion and mentor in the early stages of recovery, identifying and connecting with local recovery mutual-aid societies in an effort to facilitate a self-directed shift from formal to informal supports and relationships. At this time, Medicaid funding for credentialed specialists with lived experience is extremely limited, despite research proving their increased efficacy. “We simply meet people where they’re at. I see what we do as holding their hand and walking with them until they are strong enough to walk the rest of their journey on their own. Peer Support is about empowering people to find their own healing, their way. This is why people like peer programs in the first place. Justin Beattey is project manager for the Indiana Association of Peer Recovery Support Services (IAPRSS). Justin explains, “The first immediate barrier for those of us with substance use problems is the argument that ‘you don’t understand’. Peer supports provide non-clinical services based on our own personal experiences. Working with us, that initial barrier is torn down right away–Simply put, I DO understand because I’ve been there myself“. Justin also works with the IAIC to advocate statewide for peer-based recovery services. “What I would like to see personally–if you look back through the seventies, most treatment centers were once staffed entirely with people in recovery themselves. That said, I think the clinical/academic side is definitely needed in this field as well. A major barrier is the Medicaid billing issue, but the biggest obstacle is the stigma around mental health issues like these in the first place. People with substance use disorders tend to wear it like a badge of honor, while the mental health side of the field is more shy and apprehensive. Ultimately we need both sides to really address stigma. KEY Consumer Organization’s Annual Consumer Conference: April 19th! KEY Consumers’ Executive Director Sarah Gunther explains their peer-oriented nature, “We’re a consumer-run organization, we are all consumers of mental health services here.” Cummins Behavioral Health Systems is pleased to announce it has partnered with KEY Consumer Organization to present their experience with the employment of peer recovery specialists through a series of workshops. 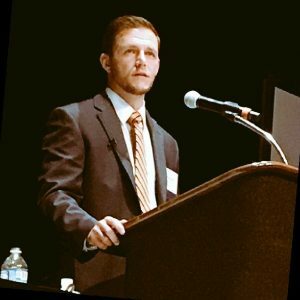 The keynote speaker at this year’s Key Consumer Conference is Brandon George, Director of Indiana Addiction Issues Coalition (IAIC). As a person in long-term recovery himself, Brandon has dedicated his life (both personally and professionally) to fighting addiction and promoting recovery. His personal experience, education and professional accomplishments give him the perspective to see both sides of recovery. The KEY Consumer Organization Annual Consumer Conference is coming up April 19, 2019. Call the office at 317-550-0060 or email officemgr@keyconsumer.org to request a registration packet. The provider/administrative track will have break-out sessions focused on peer-providers working in mental health programs. This track will cover a host of material, including information about peer-providers in agency settings and management and supervision of peer-providers. The sessions will include Engagement and Connection: The Ultimate Value of Peer Support; Hiring Practices: Finding A Peer Support Specialist; Effective Supervision of the Peer Recovery Specialist: Support and Development to retain the Peer Workforce; and Ethics of Peer Recovery Services. Do you know a mental health professional who openly embraces personal experience with mental health struggles? When we come together in the spirit of peer fellowship (to talk about the elephant in the room) we help make recovery possible for everyone in our community. Please acknowledge their efforts and bravery with your support by sharing this article!